Saturday: Flutist Aaron White (Navajo/Ute) who was a 2003 Grammy nominee as part of the group Burning Sky. Sunday: Flutist and multidisciplinary visual artist Randy Kemp (Choctaw/Euchee/Muskogee Creek) and acoustic guitarist Dean Yazzie (Navajo). See Hopi katsina carver Ryon Polequaptewa demonstrating his art 11 a.m. to 3 p.m. Saturday, and Yaqui painter Abel Ochoa demonstrating his art 11 a.m. to 3 p.m. Sunday, each in front of the museum’s Books & More. These artists’ demonstrations are supported by a grant from the Margaret A. Cargill Foundation. Enjoy delicious food and drinks–including some special truffle-salt-and-Parmesan-cheese-covered popcorn and a special adult beverage called an “R2C2” — at our Coffee Cantina. 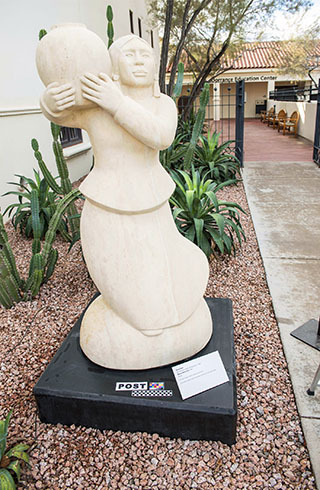 Our Courtyard Cafe will be open both days from 11 a.m. to 4 p.m.
Take a self-guided tour of recently restored sculptures installed on our grounds, including those restored thanks to a 2015 Bank of America Art Conservation Project Grant. We will have available free maps showing where the sculptures are located. Download the map here. Youth can participate in Kids Detour, where children can paint and decorate ostrich eggs set up at the Heard’s trolley stop and stops at the other four “hubs” of the Art Detour trolley/shuttle routes. All will take place over a weekend dedicated to celebrate the many arts and culture offerings in the central core of Phoenix. Admission to our courtyard entertainment and sculpture tours is free; we’ll have food and beverages for sale. Museum admission is additional. Inter-Tribal Council of Arizona, 2214 N. Central Ave. (west end of lot). DOXA building, 2005 N. Central Ave.
ICE building, 2035 N. Central Ave. 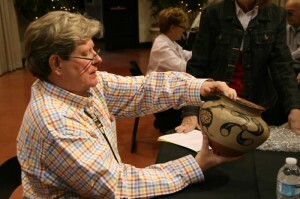 The website, artlinkphoenix.com, quotes Phoenix Mayor Greg Stanton: “Art Detour is one of the most important events in Phoenix’s calendar.” So take the mayor’s advice and enjoy the weekend — and make sure you stop here at the Heard Museum while you do. Don’t forget Appraisal Day, March 19! 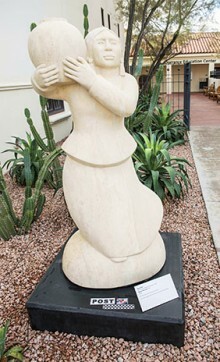 Navajo Water Girl, a donation from sculptor Doug Hyde (Nez Perce/Assiniboine/Chippewa, b. 1946), is one of several sculptures on the Heard Museum grounds conserved thanks to a 2015 Bank of America Art Conservation Project Grant. This photograph was taken after conservation was completed.